Larry Zabar is the honoree at the Northeast-Arc’s May 3 fundraising event. On Thursday, May 3, the Seaport Hotel in Boston will be transformed into a local star-studded runway as the Northeast Arc hosts its signature fundraising event, “An Evening of Changing Lives.” Emceed by Kim Carrigan, longtime Northeast Arc advocate and host of “The Boston Morning Show” on WRKO-AM, the evening also honors Larry Zabar of Swampscott, Executive Vice President for The New England Council and longtime Northeast Arc supporter. “We are honoring Larry to shine a spotlight on all the remarkable work he has done throughout New England, especially in creating opportunities for people with disabilities,” said Jo Ann Simons, CEO, NE-Arc. She expects over 450 people to attend the event. Zabar serves as a NE-Arc board member, chair of the development committee and vice chair of the advisory board. He is also the longest serving member of The New England Council, the nation’s oldest regional business organization. “Receiving this award allows me to shine a spotlight on, and hopefully raise funds to support, an organization and a group of employees who really deserve this recognition. No one works at the NE-Arc because it’s easy and no one works there to get rich. They work there because of the importance of the mission, the value of giving back, and the difference they can and do make every day in the lives of people with disabilities,” Zabar said. The NE-Arc is a not-for-profit organization that helps children and adults with, or at risk for developing, disabilities become full participants in the community. The evening also features a fashion show spotlighting local celebrities, dignitaries, and business leaders who will be paired with individuals whose lives are changed as a result of the community’s support of the NE-Arc’s services. The show will feature 12 models that represent the entire range of NE-Arc services, including early intervention, family support, employment and residential services. These families who receive NE-Arc services will be paired with local notables, such as Boston Globe Journal Editor Doug Banks and Dan Cahill, Representative for the 10th Essex district. Among those walking on the runway will be the Heller family, whose son Luke has been diagnosed with a rare genetic mutation. “NE-Arc has done so much for Luke and our family. The runway event is an opportunity to say thank you and to raise money and awareness in the community, because NE-Arc is so important to many families like ours,” said Jody Heller, Luke’s mom. Luke started with NE-Arc’s specialty early intervention program, Building Blocks, and now receives services through its Applied Behavioral Analysis program. “The Arc has been life-changing for us,” Heller said. “The Hellers are a remarkable extended family who represent part of the village that it takes to raise a child who has additional needs,” Simons said. Shirley Leung of the Boston Globe, who served as a judge for last fall’s ArcTank competition, will model with her 5-year-old son. who has autism. “Each pair has a story that is inspiring and helps represent the 10,000 lives we change every day,” Simons said. For more information or to buy tickets, visit https://ne-arc.ejoinme.org/MyEvents/AnEveningofChangingLives2018/tabid/940603/Default.aspx or contact Paula Vrattos at (978) 624-3080 or pvrattos@ne-arc.org. NOVEMBER 30, 2017 – In 2002, Jo Ann Simons and Steven P. Rosenthal happened to pick neighboring elliptical machines at the Jewish Community Center of the North Shore in Marblehead. During their workout, they chatted. Simons learned of Rosenthal’s interest in philanthropy; Rosenthal learned about Simons’ interest in intellectual and developmental disabilities. Neither had a clue that 15 years later, they would partner to revolutionize the way their two fields could intersect. It all started when Rosenthal was planning his 2017 donations. The Marblehead resident and former CEO of Northland Investment Corp. knew he wanted to do more than just write the traditional check to a nonprofit that supports his core values of “tikun olam” (repair the world). He wanted to inject innovation and creativity into the process, setting an example that might encourage other philanthropists to think outside the box. He immediately thought of Simons, now CEO of Danvers-based Northeast Arc, which is at the forefront of providing innovative services, education, and training to 9,000 adults and children with disabilities each year. “We are a thought leader. 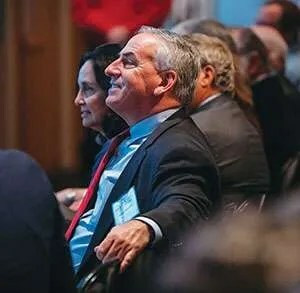 We want to establish ourselves as the most innovative, creative, strategic organization in our industry,” Simons said of Northeast Arc, which has 1,100 employees and a $250 million budget, and reaches 190 communities throughout eastern Massachusetts. It was a good fit. Rosenthal, who now runs the Boston real estate investment firm called West Shore LLC, donated $1 million to Northeast Arc to launch The Changing Lives Fund. He, Simons, and the Arc board of directors then brainstormed to come up with a groundbreaking approach to spending that money. Borrowing from the name and competitive methodology of “Shark Tank,” the popular ABC television show, the team created “Arc Tank,” where anyone with a creative concept to aid people with disabilities can pitch an idea and compete for funding from The Changing Lives Fund. “We realized we can develop initiatives that support our mission and leverage the money for a greater impact if we give it away,” Simons said. Of the 100 proposals from all over the world that flooded in after the competition was advertised, 45 were selected for the “holding tank.” Outside reviewers recommended seven finalists. 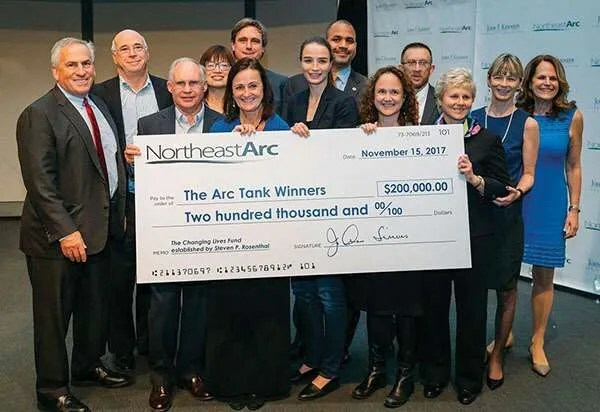 The inaugural Arc Tank contest, collaboration between Northeast Arc and the JFK Library Foundation, took place on Nov. 15 at the JFK Presidential Library and Museum and awarded $200,000. Over 300 people attended. • Pathways to Inclusive Healthcare,” submitted by Dr. Carolyn Langer, associate professor at UMass Medical Center in Worcester, received $80,000 to develop a pipeline of healthcare professionals to ease the transition from pediatrics to adult medicine care. • The Center for Public Representation of Northampton, a public service law firm, received $85,000 for its proposal, “Disrupting the Guardianship Pipeline,” to create an effective alternative to guardianship, often the only option for people with intellectual and developmental disabilities. • “Water Wise,” submitted by the YMCA of the North Shore in Beverly, addresses the fact that drowning is a leading cause of death for children with Autism spectrum disorder by developing a water safety program that targets specific needs. The $30,000 grant will fund the program in two locations next year, with plans to expand to eight sites by 2019. In addition, two incubator proposals were awarded $2,500 each. Andrew Holmes of Winchester, a junior at Olin College of Engineering in Needham, is developing “Shop, Drop and Roll,” a wheelchair attachment that simplifies the transport and accessibility of goods on the back of a wheelchair. Nathaniel Lorenz Galdamez, a freshman at Swampscott High School, is designing “The BIONIC hand,” a wrist device to assist computer usage. Rosenthal couldn’t be more pleased with the first Arc Tank. “The event was a terrific success. I think we have started an important and much needed conversation about innovation and philanthropy,” he said. Congregation Shirat Hayam (CSH) in Swampscott and Temple Sinai in Marblehead were among the dozens of synagogues that applied for Ruderman Synagogue Inclusion Project (RISP) grants in 2016. They both were selected and on May 23, they will be among the nine 2017 Cohort of RISP Congregational Partners welcomed and recognized at the annual CJP “Celebrating Inclusion” event. 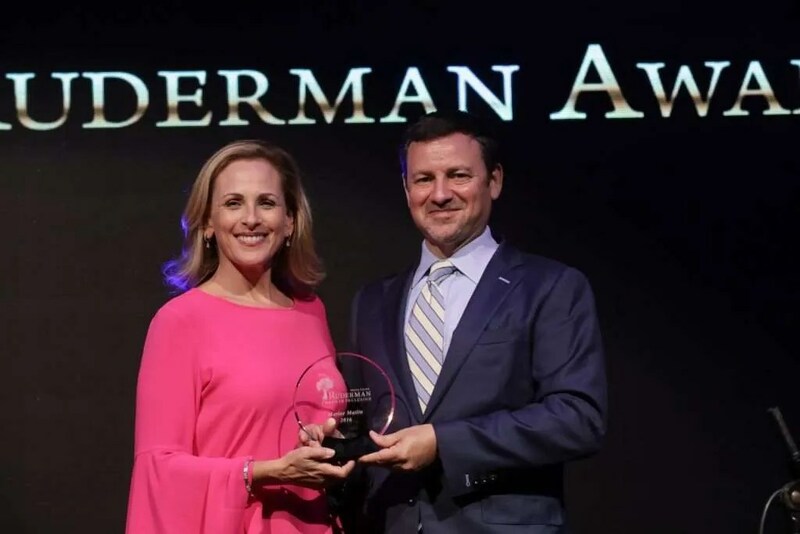 For over a decade, the Ruderman Family Foundation philanthropic mission has emphasized disability advocacy and inclusion. Its newest initiative, RISP, awards $5,000 grants to synagogues in the Greater Boston and North Shore communities to help fund programs that ensure that all people, including those with profound disabilities, are able to participate in congregational activities. RISP started as a pilot program in 2013 with just three Boston synagogues. Sharon Shapiro is the daughter of founder Morton E. Ruderman and a Ruderman Family Foundation trustee. As Community Liaison, she is in charge of all projects in the greater Boston and North Shore areas, including RISP. Silver was particularly struck by Temple Sinai’s and CSH’s strategic and thoughtful Inclusion Action Plans and ambitious goals. “What stood out about their applications was a deep and profound desire among both communities to be a “kehillah k’dosha”, a holy community that strives to welcome everyone who walks through their doors. Rabbi Michael Ragozin hopes CSH will become fully inclusive of children with disabilities and their families. “It’s heartbreaking to hear the stories of rejection that families, seeking to raise their children in a Jewish community, families whose children will thrive in a Torah environment, have experienced,” he said. Beyond the letter of the grant, he also hopes CSH will become even more inclusive of interfaith families, the LGBTQ community, households with varied incomes, and individuals experiencing mental health issues. “Inclusion is a clarion call to honor the uniqueness of each one of us,” he said. Temple Sinai’s Rabbi David Cohen-Henriquez agrees. “To be able to reach and kiss the mezuzah, to be able to drink water or go to the restroom, to have access to the bimah and the Torah, to be able to read and hear the services are things we might take for granted,” he said, noting many others in the community might not be as fortunate. Both synagogues have formed Inclusion Committees with ambitious and concrete goals and plans for the coming year. Amanda Clayman and Michele Tamaren co-chair CSH’s 14-member “Shir Lanu: One Song – Every Voice” committee. Deborah Shelkan Remis chairs Temple Sinai’s nine-member committee. Remis pointed to the network already operating for congregants who need rides or meals, have hearing assisted devices or need large print siddurim. “This is just the beginning,” she said. AT CSH, Hebrew School director Janice Knight leads Torah study focused on inclusion as a Jewish value and has invited trainers to work with staff and teens through “Gateways: Access to Jewish Education”. CSH greeters have received training on the use of inclusive language. An accessibility handout itemizes available inclusion support. “We believe inclusion is holy, just and divine. Everyone is welcome and must feel welcome at Shirat Hayam,” Clayman said. Ruderman trustee Shapiro remembers about five or six years ago when someone from CSH with an adult son with disabilities was trying desperately to make changes at the synagogue. “I think it took this project and other families coming forward to make the wok really impactful in the synagogue top down and bottom up,” she said. That “someone” is Marcy Yellin, whose 32-year-old son Jacob is a regular at CSH events and services. “I’m thrilled for Shirat Hayam to be included in the Ruderman Foundation grant. I have great respect for all the things the Foundation does. It’s wonderful to see that people are taking disabilities seriously and mobilizing together to support our most vulnerable, especially in the Jewish world,” she said. Lifelong artist Susan Dodge loves her new position as Director of ArcWorks Community Center in Peabody. “The job I am doing now is just such a reward. I smile everyday. I’m happy to go to work. And I get to do so many things I really love, like curating shows, working with artists and envisioning what the next project will be,” the Salem resident said during an interview at The Bridge at 211 in Salem, where she currently has a piece on exhibit. The Northeast Arc (NeArc) is a not-for-profit organization that helps children and adults with disabilities become full participants in the community. ArcWorks is its inclusive art center, which serves artists and viewers of all talents, skills, interests and backgrounds and provides artistic opportunity for people with and without disabilities. In her role as its director, Dodge is responsible for scheduling gallery shows at both the art center and Breaking Grounds, the coffee shop in Peabody that NeArc runs. She also creates curriculum and teaches various art classes during the day to NeArc clients and in the evening to community members. “I am happily tired at the end of the day,” Dodge said with a smile. Tim Brown, Dodge’s supervisor and NeArc’s Director of Innovation and Strategy, couldn’t be more pleased to have Dodge on board. Dodge’s impressive resumé includes teaching art; a commission for 48 paintings at the famed Palm Beach, Florida property, The Breakers; a seven-year stint as Project Manager at a web design firm; a business career in sales and marketing at The Hawthorne Hotel; curating many art shows, and owning her own pottery studio, The Artful Dodger, through which she sold murals, tiles and signature pottery throughout the U.S. and the Virgin Islands. She earned a B.F.A from Massachusetts College of Art and returned to school at age 48 for a certificate in digital graphic design. According to Brown, the diversity of Dodge’s experience was exactly what NeArc hoped a new director bring to the position — the abilities both to develop an engaging class structure using a variety of mediums, and to manage the Gallery Shows and Shop within the ArcWorks program. “Within her first four months at NeArc, she has curated five different gallery shows. Each show brought new artists and viewers, expanding our reach and recognition within the art community,” he said. Prior to her current position, Dodge has always taught private art classes to children. This is her first time working with students with disabilities, but she sees more similarities than differences. “I look at people with disabilities as just people. Creating art in so many ways is about honing a technique and seeing things. Everyone has their own vision of how they see things. Basically, making art is just translating that vision into an object or putting it on a canvas or a paper,” she said. She works with 25-year-old Polyvios Christoforos twice a week. “He is a prolific painter. We work together really well,” she said. Christoforos’ work was featured in a collection of greeting cards handed out at NeArc’s “An Evening of Changing Lives Dinner and Fashion Show” on April 29. “When you teach people with disabilities, you have to be really present, and compassionate and listen really well,” Dodge said, noting that many of her clients have speech-related issues. “I have developed different ways I work with people” depending on their needs. Over the years and from her teaching experiences in the U.S. and abroad, Dodge has noticed a consistent and common thread among all her students: they share an eagerness to create something they can be proud of. “In my core, I believe that everyone is an artist. It’s just a matter of letting yourself do it without judging what you’re doing,” she said. For more information, visit ne-arc.org.